In the fall of 2010, I gave my presentation entitled, Behind the Scenes; A Grief Deconstructed, at a police-based victim services conference in British Columbia. In this particular presentation, I go into detail about the psychological, emotional, physical and spiritual components of my experience grieving the death of my husband, John, a police officer. After the presentation, an RCMP officer came up and shared his story with me. His teenage daughter had been struck and killed by a car as she was crossing the street at a pedestrian cross-walk. He was devastated. But he went on to explain how a police Chaplain had helped him tremendously in the days and weeks following his daughter’s death. And it struck me: this is also what people who work in victim services do…they support strangers during the most horrific moments of their lives. And even though they can’t even begin to make anything okay again, they can be there for people during their greatest time of need. And this presence can be an extremely important gift. During my time of greatest need, I didn’t meet any victim services volunteers. Instead, I had a phenomenal support network of family, friends, police officers and Chaplains surrounding me. Heck, I wasn’t just moved off the road; I was picked up and put in a safe little nest with dozens of protective mother hens guarding it! Two of my “chick safe-keepers,” in particular, stand out. The first was my brother, George. After spending seventeen hours with John in the ICU, the time came for me to say goodbye when an operating room became available for his organ removal surgery. The medical staff wheeled John’s hospital bed from the ICU into the operating room – and I’d followed him through the halls and right into the OR. But when we are in times of crisis, we often don’t KNOW when enough is enough. We’ve lost all perspective because suddenly there is no normal. And it is up to the people around us – be that family, friends, colleagues, professionals or strangers – to have the courage and compassion to remove us from a situation we no longer need to be in. In the weeks that followed, my brother Doug became the chief safe-keeper of the chick. He was the mother hen of all the other mother hens. Doug fed me, watered me, put me to bed, dragged me out of bed, listened to me, answered my questions, fielded the dozens of phone calls, kept me on track meeting all the lousy new obligations my days held…funeral arrangements, choosing a headstone, meeting with lawyers and so on. So fast forward a decade to my Behind the Scenes presentation at the victim services conference in BC. The day I delivered that, I knew the time would come when I would no longer be giving those intensely intimate presentations. I was beginning to suspect that by continually dredging up a painful past for the sole benefit of others – for doing so had long since ceased to be of much therapeutic value to me – I was inadvertently keeping myself in baby-chick-mode: supposedly safe but stuck. For although it may seem safe to stay in a situation we have outgrown but is no longer healthy, versus finding the courage to change, the reality is that we may actually be at risk of victimizing ourselves. Unfortunately, I had no idea how right I was about this. 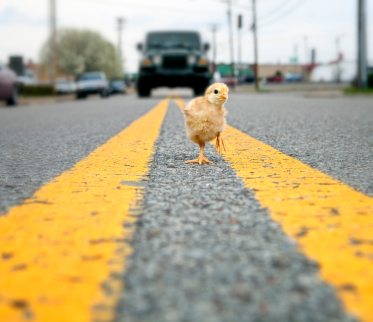 But the RCMP officer’s ‘chick in the road’ analogy gave me a great idea. The next time I gave my Behind the Scenes presentation, I would incorporate his story to demonstrate the integral role that people working in victim services play. I would also have my presentation professionally filmed and put on a DVD for educational use by victim services units. So my intended audience could still hear my presentation – it just wouldn’t be live. Then I took it a step further and decided to create a Behind the Scenes “info kit” which would have the DVD of the presentation, a copy of my book, A Widow’s Awakening, and one other item to complete the chick theme. This warm fuzzy will give you luck in your exam. Whenever you get nervous or worried, just remember he is in your pocket to remind you of our love. Unbeknownst to me, John had kept that little fuzzy with him all those years. He had it in his duty bag the night he died – it was in the police car. After his death, the police returned John’s duty bag to me and when I found the strength to go through it, there in the side pocket was the little chick and the folded-up, worn-out note I’d given him a decade earlier. So the other item I wanted to go in the Behind the Scenes info kit was a yellow chick/warm fuzzy and note of encouragement to victim services workers that the greatest gift they can give people is not necessarily their advice; it’s their presence. That was my plan. The universe, however, had a different one. When I delivered what would turn out to be my last Behind the Scenes presentation at another police-based victim services conference in the spring of 2012, I did have it professionally filmed. But the “info kit” idea for use by victim services units didn’t take off – because people wanted to hear an actual person deliver the Behind the Scenes presentation versus watching a DVD. Fair enough. So if I wasn’t going to give the presentations anymore, who would? Well, I asked Jody Laird, who delivers many of the John Petropoulos Memorial Fund’s Officer Down; Put Yourself in Our Boots workplace safety presentations and is also a social worker, if she might be interested. She said yes! So that’s exactly what she’s doing now. And since educating people about the public’s role & responsibility in ensuring their workplaces are safe for everyone, including first responders, is the primary message of the JPMF, Jody always incorporates that in. And there you have it. Though more than a decade had passed since John’s death, my continued public speaking about the graphic details had kept me a chick in the road. The time had definitely come to let that practice die – and in so doing, it not only gave Jody the opportunity to do work she loves, she is able to reach far more people. Likewise with the regular safety presentations that Jody – and Lindsey Jepson, the other main JPMF speaker deliver: by me backing off on doing work I no longer enjoyed, that not only gave other people the chance to shine at their passion, it also ended up being WAY more effective. 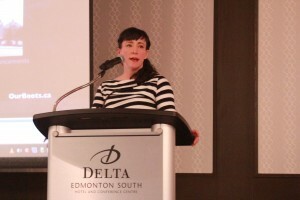 Jody and Lindsey have delivered the JPMF’s workplace safety message to more than 6000 Albertans in the past 2 years! And if I had still been doing those presentations, I certainly wouldn’t be doing what I am passionate about: writing. It just took me twelve years to hear it. 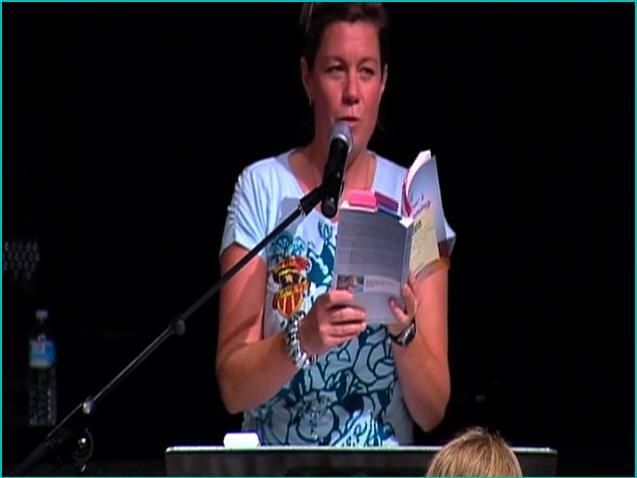 Maryanne Pope is the author of A Widow’s Awakening and the playwright of Saviour. Maryanne is the Board Chair of the John Petropoulos Memorial Fund and the CEO of Pink Gazelle Productions Inc. To read more of Maryanne’s blogs, sign up here to receive her e-zine. Phew…THAT article has an incredible impact. Wow. It says something so helpful, so meaningful, and you do so with such gentle force. I really enjoyed it and took a lot from it and I know many others will too. It made me see things from both the baby chick point of view and the mother hen pov and I’ve been in both roles, so I found it very enlightening and moving. I think, too, until you’ve been in either of these roles, like taking someone off life support (hard to even fathom til you’ve been there in that stark room with all the machines, bleeps, whirring lung machines, and computer generated heart beat lines, pulse blips, etc. ), you really have NO idea how you will respond, and you need those mother hens to take you gently by the arm at the right moment. ; or you need to BE that mother hen for someone living in a blur of surreal reality. One thing that I thought was so wonderful was that your two most important mother hens at that time were your brothers. Ah yes, I remember this story well from our road trip when you told it to me as we ate animal crackers and were trying to guess what animals we were eating! Oh and I absolutely LOVE the photo you chose. Good work! I just watched WFYB and was compelled to place a comment about the doc. Although I’ve had my own horrific ordeal with my pregnancy and daughter’s birth, ultimately she is now okay. I cannot imagine what you’ve had to go through to get to where you are today. I just searched a good portion of your site. Congratulations on your courage and all your hard work. You are improving the lives of so many around you and countless people you will never meet. It’s unbelievable what you have created in this time. I love the story of the chick in the road and cried at the story of the chick in John’s bag. Then I thought of all the mother hens in my life, and cried again. Words fail me, other than: Thank you. The words, “That’s enough for today.”, is needed to be said to so many people surrounding us. When we are in the thick of things, the view is very narrow. Trusted community is needed for each one of us, to be able to see beyond what we are so focused into. I am so blessed to experience your gift of sharing, to now be unstuck, and moving on to the treasures that you give us that come from within you. I thank John for the “seed” that he gave you as a gift, that you now carry around in your heart. The seed of words are growing into a beautiful tree of wisdom and knowledge that you are now sharing as new seeds, planting them in the hearts of others. Thank you for getting unstuck. beloved dog and how you did not give up. Are you writing another book in follow-up to your first one. I am waiting to read it! I am not defined by what happened to me. I am defined by my actions– my inner courage and my strength to move forward. Thanks for your message TODAY Maryanne.